Sharon Harris was walking home one afternoon when she spotted the words “I love you” spray-painted in indigo blue on a wall. It brought a smile to her face. But the smile was replaced with awe as she counted 13 more “I love you” sentiments within a few blocks in her Annex neighbourhood. Harris photographed as many of the graffiti artist’s notes as she could find. She took some of her favourites and turned them into “I love you” calendars for friends and family. Smitten by the anonymous artist, she kept collecting. When she had photographed more than 100, Harris decided to post them on the Internet. It was only then she learned similar messages of love had been written in Winnipeg, Victoria, New York City, China, England, Sweden, Israel, and India. She thinks the heartfelt sentiment showing up around the glove is indicative of the times in which we find ourselves. “Public spaces are taken up with corporate messages: billboards. Graffiti comes from the grassroots and people respond to it,” Harris said while sipping a latte at Dooney’s café in her west-end neighbourhood. Her photos have been on display in the coffee shop since November. The mother of two boys believes if we could all say “I love you” more freely, things wouldn’t be so grim. While sentimental graffiti may not have an impact on world events, it has been noticed in this part of the city inhabited by students, immigrants, blue-collar workers, writers and artists alike. It even made it to the lecture halls of the University of Toronto, where English Prof. Nick Mount made mention of it in his class, Literature for our Time. Graziano Marchese, owner of Dooney’s Café, said the photos have been “the most successful show we’ve had.” Usually photographic exhibitions don’t do well, he said, but this show has made people look up from their newspapers, pause between sips and discuss something other than unreturned calls from a publisher. And it’s not just the usual coffee-shop types who are stopping in for a peek. He said people of different ages and ethnic backgrounds are coming in because of the mass appeal of the “I love you” photo exhibit. 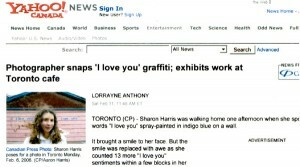 Marchese said that even though he lives in the neighbourhood, the graffiti didn’t register until he saw Harris’s photos. “You probably see it subconsciously when you’re driving,” he said admitting that one of the photographs is of a spot he passes every morning on his way to work. Harris said she has sold many of the photographs, and one was stolen right off the wall of the café. “It’s fitting, as graffiti isn’t the most legal thing,” she said. But not everyone in the café is a fan. “Essentially this sort of art is not my cup of tea,” said one patron sitting at the bar with an empty cup and a well-thumbed copy of the day’s New York Times. “But hey, the house of art has many rooms and anyone can inhabit it,” he said. Love is far too complex and mysterious to be scribbled on a chunk of concrete and photographed, he said. The café regular thinks the whole thing was contrived. He believes Harris had someone paint the messages and she followed behind and took pictures. “I wish I had thought of that,” Harris responded when told of the allegations of a set-up.